So I got this great idea that I wanted to do Independence Day nails. The 4th is my absolute favorite holiday, because I love being a pyro, and fireworks are my absolute favorite. Unfortunately, I got about 1/2 way done with this look and decided I hated it. So I took these pictures to show you all and then took it off. I did come up with a cool look, that I will be sure to show you tomorrow. I didn't even bother to do clean up before taking the pictures. I started with a base of OPI My Boyfriend Scales Walls on all fingers. 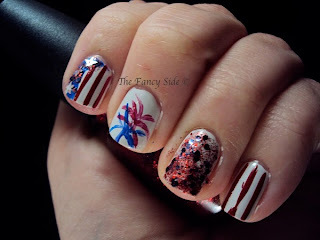 Then on my pointer and pinky I used a striper and added China Glaze Adventure Red-y. 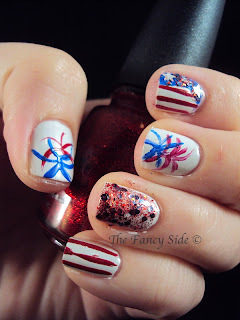 I then layered on China Glaze Ruby Pumps for some added sparkle on the red stripes. For the blue I used Essie Butler Please. 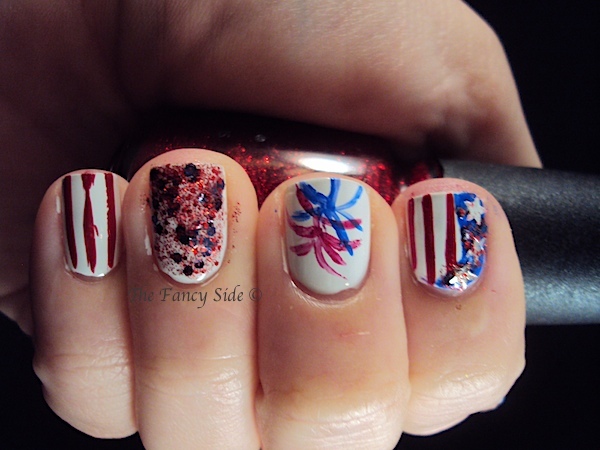 On my thumb and middle finger I tried to create fireworks with Adventure Red-y and Butler Please. On my ring finger I layered on a coat of Pure Ice Freedom, a glitter topper filled with mini red glitters, small blue Hexes and silver stars. This look wasn't terrible, but it was pretty generic. I just didn't like it, plain and simple. What do you think? Thanks! I think if I had to pick it would be the best one. It just went off the tracks for me and I'm happy with what I came up the second time around. I love your pointer! I look forward to seeing your other nails :) Although I don't think these are a fail at all, they are cute!! Thanks sweetie! They were a little to all over the place and run of the mill for me. Aw, thanks. I just wasn't feeling this one. you totally get me. It just wasn't the look I wanted. Haha! Nuts. They were just "meh" for me. I've got an announcement...and it's a big one! The Syrup Mani.....Am I doing this right?